Well, this is a thread for me to type out what I do to my bike. Most of this is just for me. Kind of an online journal for my bike. This first post will mostly be a rehash of some of my previous posts. I like doing these on forums because it lets me keep track of what I did and lets others see it all in one place, not that I am doing anything special to my bike, just getting it and hopefully keeping it running well. Nothing really exciting past this point in the first post, so unless you are bored, quit reading here. 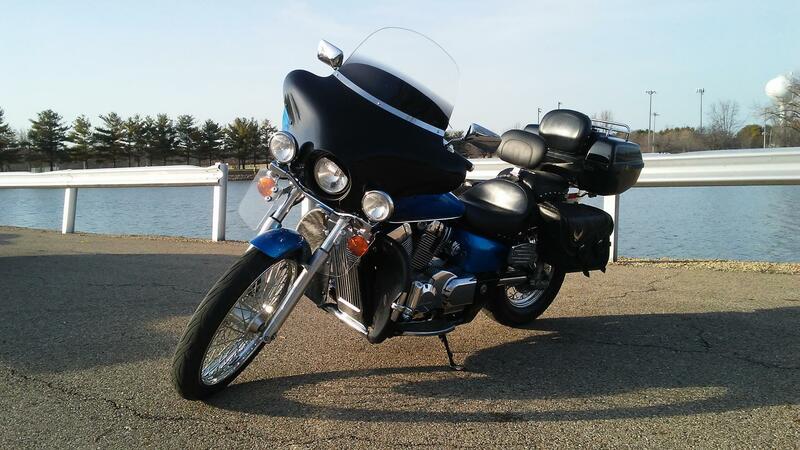 So, I just bought a 1994 VT1100 Shadow 2 weeks ago. Showed 7100 miles on the speedo when I got it. The guy I bought it from buys, fixes and sells bikes from his garage. I can say he did a great job with the carbs on this bike, starts great with just a little choke, idles fine and drives well overall. 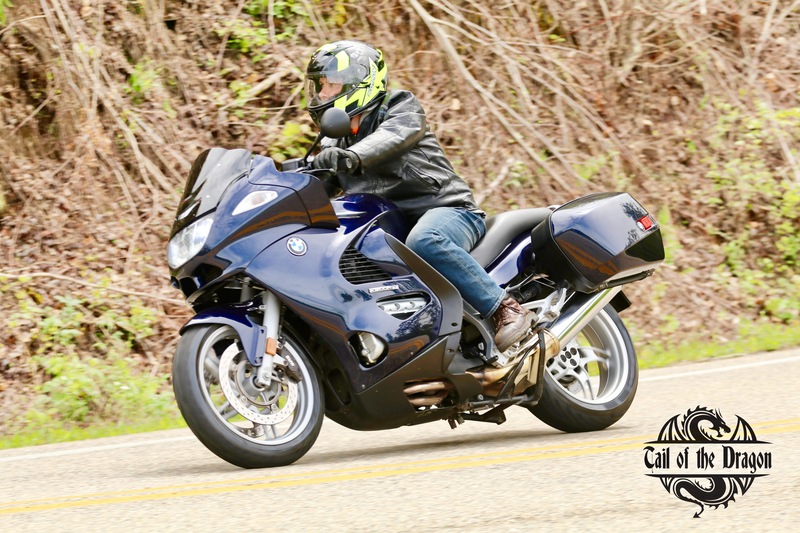 As I started looking at the bike, I was wary of the $2250 asking price. Tires had great tread, but 7 years old. And then it is a 23 year old bike. Bike looks amazing, while not showroom new, it does not look like a bike made 23 years ago. I did have a lot going for it though for me. It had a windscreen (I would add one to whatever I got, so $150 or so in value for that), had a Mustang seat (although from a '95 VT1100, so not a perfect fit, but good enough, around $400 value), it had a light bar, another plus of something I would get (another $150 saved), as well as a rear back rest and rack (both things I would add, and would cost another $200). So $900 in accessories that I would want already on the bike. This does not count the passenger floor board, highway pegs and mini crash bar (all of which I would not have bought). 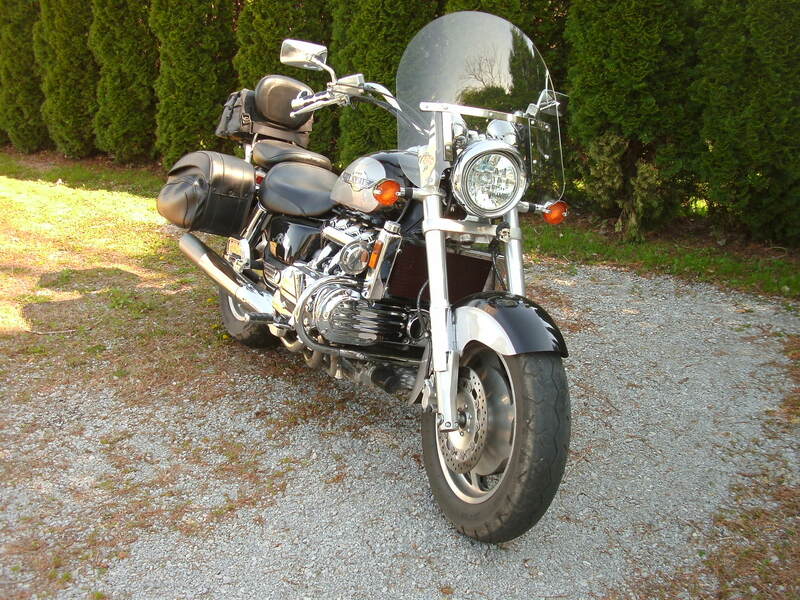 Took it for a test ride, looked it all over (wish I had looked better, more later), and offered $1800. Seller balked initially, saying that is what he got the bike for, and it was not running when he got it. As I was turning around to leave, he said OK.
Once I got it home, I started doing a much better inspection of it and figuring out what I need to do. Thanks to this forum, I got a lot of that figured out. I found what appears to be a new, corrct sized AGM "T" battery made by MotoBatt (MB16A battery). Looks like it may have come from the bike being loaded into the back of a truck or into a trailer? Regardless, it was coming off. Another thing I found was that the bike was overfilled. I drained 4 qts of oil, plus what was in the filter. Put in some Supertech 15w-40 and a Supertech oil filter. This is a short run oil change (like 500 miles) just to give me an idea what the oil looks like when drained out. I did notice the shifting improved (mainly the ability to find neutral from both 1-2 and 2-1). Next oil change will be with more of the Supertech 15w-40 (maybe some Rotella T4, have not decided) and a Fram Tough guard filter (don't start on Fram, I know what I am doing, I don't want or need your opinion). I also changed the shaft drive fluid. I use Supertech 80w90 in there. The old fluid was not too bad looking, but as I said, I change all fluids when I get a vehicle. Clutch and front brake fluid were changed, looked pretty good coming out, but it needed to come out. Still have not done the coolant, but that will be in the next week or so. I pulled the plugs (well one on each cylinder) and they look new. Air filter looked new as well. So I start checking everything else out since I need to get it inspected before I can do a title transfer, and while double checking all the bulbs, I find that the high beam is not working (why I did not check it before hand I don't know, just did not think about it). I also find there is a 3 way switch on the upper right side that is connected to the aux lights. The lights are always on, no matter where the switch is? Odd I think. So I first go check the fuse. It is blown. Put a new 10a fuse in, and as soon as the key is turned on, it blows. Hmm. I go to check the bulb, and when I pull it out, I find a wire tapped into the low beam light, that runs to the middle pole of the 3 way switch for the aux lights. OK, I can see what they were thinking, but way too much power to pull off the headlight, but wait, the low beam works with a blown fuse??? Looking at the 3 way switch, the bottom pole has 3 wires, 2 going to the lights, 1 going under the gas tank? Why? Well, before I pulled the tank off, I finished checking the lights, and found that when the left turn signal was turned on, the low beam and aux lights turn off? What? I go pull the tank and start following wires. Turns out that whoever wired the lights ran a "+" wire from the left side running light "+" to the lower pole on the switch. This is what shorted out the fuse. So I end up pulling all the wiring out for the Aux lights (with no fuse or relay on them) and decide to fix just the headlight for inspection. I end up taking the hi/lo switch apart to find a small metal contact missing. Guess the PO took it out due to the headlight blowing? No idea. Anyway, after trying to make a contact, and going through 4 more fuses, I decided to say screw it and hard wired the low beam for now, so I am in search of a new switch (hope to have fixed very soon). Once that was done, I wired up the Aux lights correctly with a fused line and relay. I found out they have a hi and low option, hence the 3 way switch. They work properly now and I have much better lighting since I got them aimed correctly. As I looked over the bike more, I have found that I have Progressive shocks (forget which model), a shaft drive chrome cover, as well as a chrome radiator cover. I know the progressive shocks alone are a $400+ purchase, which makes me feel even better about the price I paid. I have been looking around here for ideas of things I can do to the bike, as well as searching e-bay and amazon for ideas. Have a few things coming that I will post here later about. I finally got it 100% legal to ride today. I got the inspection done yesterday, the title switched, and vehicle registered/new plates today. Oddly enough, today is the first day since I got it that I have not ridden it. I have tinkered with little things to make it more to my liking (adjusted the shifter more to my liking, as well as the parking brake). I pulled off the "cruise" thing it had, it was not working properly and was in the way of my thumb (I was taught to ride with your right thumb resting on the right side control, just above the start switch). I am getting used to the 4 speed transmission though. It was odd a first with it, I kept shifting too early. I guess I was used to my brothers 883 that you needed to shift as lower RPM's. Reading here about those with the 4 speed showed me that these engines like to be rev'ed. I am liking it since 1st gear is good up to ~30 mph. I don't have to shift at all getting out of my subdivision, and only see 4th gear above 70. Well, if you got to the bottom of this, you really need to get a life. Thanks for reading and I will post up as I do more. Nice rundown, and a sharp looking bike! Your bike sounds like mine. I got her for a good price but found so many hidden problems. Curious as to the brand of tires that came on it. It sounds like the previous owner might have been a member way back then. Maybe @Scared would know.....as he mentions it was in a trailer.....those trailer folk tend to run in the same crowd!! I no longer have the trailer. They kicked me out of the club. Solid post to read through, sounds like you are quite handy at working on things. I've just started on bikes but I aspire to be the same sooner than later. Yeah, one of the "fun" things about buying used, especially when it is old. It has Dunlop 404 front and rear. I have no complaints about them, but have nothing to compare them to. I like to tinker. It is how you learn a lot (as well a little formal education, I took a few basic automotive courses to help my knowledge, the electrical course was the best thing I have done). I got my Honda Service manual in the other day, forgot to add that to the post. Lots of good information in it. I would highly recomend it if you plan on doing any work on the bike yourself. It was $30 on e-bay. Today I removed the windshield. I was having something vibrate at higher RPM in the front, and this morning found that one of the mount bolts had slipped a little, and the spacer was what was rattling. From what it looks like, this is a generic windshield, because it had some of the brackets bent to make it fit properly. It does not look bad, but if you look close, you can tell. I also had to wash my bike for the first time. Not because it was dirty, but because I was stupid when filling with gas. I was filling with a gas can, and looked up at my son for a second, and of course that was when it was full and spilled over onto the tank and the ground. I was going to wax it, but found I was out of wax, so I need to grab some when I go to the store next. I have found that the side covers do not stay in place when I sit on the bike. Both the front upper "pins" pop out of the grommets. Anyone else have this problem? Any solution to it? I also adjusted the tire pressure. Was at 30 front/34 rear, set to 34 front, 42 rear (manual says 33/41 for over 200 lbs). Not crazy about firming up my ride, but I need correct pressure. And speaking of ride, since I am fat, I have turned the rear Progressive shocks to max, which firms up the ride, but keeps me from bottoming out all the time. Besides loosing weight (which I am in the process doing, I was actually over the 362 max weight of the bike 6 months ago, now 22 lbs under) anything else I can do to help the ride? If you're as weighty as you say, your problem may be you're overtaxing the rubber grommets for the side covers when you sit on the seat, but it sounds like you're working on it. You might also try ordering new rubber grommets. Honda Motorcycle OEM Parts, Babbitts Honda Partshouse) Nice choice of bikes BTW. My son has the same bike. I kept hearing of guys loosing their side covers and some are very hard to find replacements. So I put a 6 inch piece of heavy fishing line on mine so if it does come off it stays close to the bike.